Sibling discounts and financial assistance available – just ask! Enrollment is open for all Fall Sessions of this ever-popular workshop program, now in its 49th year, a fun experience for kids 7 to 12 that helps expand their imagination as they act, sing, dance, play theatre games, improvise, work with costumes and make-up, lighting and sound, sets and props, and perhaps best of all, collaborate with professional playwrights and directors to create an awesome fully staged original production with music, written just for them. No experience needed, but even the most advanced young actor will benefit from this workshop. No small parts - no playing the second tree or third spear carrier – no double or triple casting - every child receives a role written specifically for them, based on their creative input, highlighting their strengths and challenging them to excel in all theatre skills, including performance and stage technique, teamwork, self-confidence, creative expression and communication, projection and enunciation, as well as reading and language comprehension, theatre etiquette, and a true love of and appreciation for theatre arts. And small classes mean lots of personal attention for every member of the class. Classes meet weekly, Thursday afternoons or Saturday mornings, October through January. Ask about Winter and Spring Break, too, and the Summer Tokyo Theatre Adventure for ages 10 and up, and workshops for adults, too! Playhouse conservatory alumni include Kate Hudson, Zooey Deschanel, Emily Deschanel, Jason Ritter, Jason Segel, Obi Ndefo, Shana Feste, Rina Mimoun, Cami Anderson (Time Magazine’s 100 Most Influential People in the World) and Maroon 5's Mickey Madden, who calls the program "Great in so many ways!" 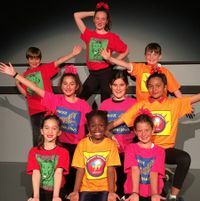 Santa Monica Playhouse is proud to be an approved program on LAArtsEd.org, Los Angeles County's one-stop-shop for quality arts education programs.